Now, normally I focus on local things, people - Fort Mac artists, events, musicians, groups, or developments. On occasion, though, someone or something from another place comes through our little city and I find they are worthy of some space in this blog. That happened a couple of weeks ago when I headed down to Paddy McSwiggin's for a night out with some friends. It turned out there was a band from Manitoba playing that night, and what had been simply a night out for drinks turned into a night out with some pretty great music (and drinks!). Q.E.D. 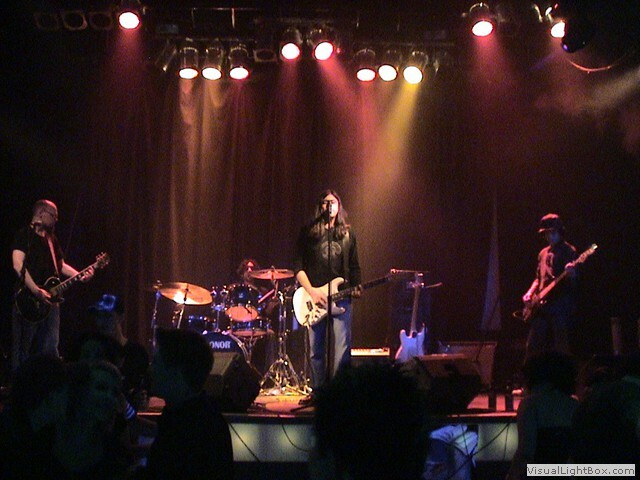 is a group of four musicians from Winnipeg. 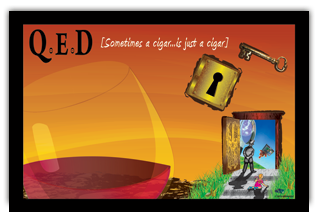 They are currently touring to promote their new CD "Sometimes a Cigar...is just a Cigar", a compilation of their original music. When I heard them at Paddy's they were doing mostly covers, but it was a wide range of covers - everything from Tom Petty to The Ramones ("I Wanna Be Sedated", which no one covers any more and which is one of my all-time favourite songs). I was impressed at their range with the songs they covered, and I was impressed with their musical talent. These boys know how to play their instruments, and they are tight, honed and infinitely danceable (which, incidentally, I did until I couldn't any more). Even my husband, a far more critical person than I am musically speaking, was impressed (he played in a band for many, many years and appreciates those who can play well). That night at Paddy's I told the band that I am a blogger and Ra, the lead singer, kindly gave me a CD to listen to. I took it home and over the next few days listened to it carefully - and I what I heard impressed me deeply. In fact, it also impressed the Intrepid Junior Bloggers, and as teen girls they can be pretty tough to please when it comes to music (most of my tunes, in fact, don't come anywhere near to passing their tests of "musical coolness"). I've listened to every song on the CD several times now, and have found some that I find particularly enchanting. I've also found some that I can see being radio material as they are catchy and interesting. I love the songs "The Glitch" and "Thinking of You". I can see many of these songs doing very well, actually. They are lyrically and musically sound, with appropriate hooks and just a very "feel-good" sense about them. Q.E.D. doesn't pretend to be anything they are not. 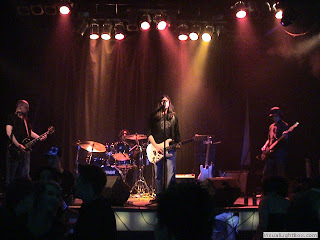 They are rock and roll, a good time Canadian band, not some European-inspired alternative group. And I think that might just be what makes them so great. Knowing your niche, exploring it, expanding it, and then spreading it to the world is what you need to do to be successful. Q.E.D. is doing this very well, in my opinion, and it doesn't hurt that they are a nice group of guys who work pretty bloody hard (and I know this aspect as I've done some touring with a band, and people, touring is a special kind of hell in many ways). Look, people, I'm no music critic, and I'm not a musician. 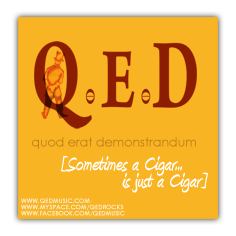 But I know what I like, and I like Q.E.D. The fact that my two teen girls like them says a great deal, as it seems they cross some generational barriers when it comes to music. In performance they are also very strong, and the show they did at Paddy's was very well received by the entire audience. So, colour me impressed. The songs from their CD have entered regular play rotation on my iPod, and I would recommend them to anyone as a great Canadian indie band. You can find their songs at iTunes, and you can also visit their website. Better yet, though, go out and catch them live. They are continuing to tour western Canada through this fall and early winter, and I believe they have planned a return date to Fort Mac in early 2012. I plan to be there, people, and I hope you will be, too - because while I love to support local talent I also love to support Canadian talent - and Q.E.D. is some Canuck talent worth supporting. 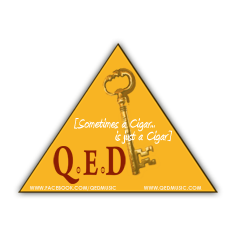 The term Q.E.D. is short for "quod erat demonstradum", and is usually used at the end of a mathematical or philosophical argument to indicate that the premise has been proven - and people I think Q.E.D. has proven talent - and potential. See ya at Paddy's, Fort Mac.